A few weeks ago my faith in this school's food services was completely restored when I found this little sandwich box in the Met. Then I went to go eat dinner and it was bad cafeteria food all over again. It was good while it lasted. Also, I've discovered that I don't hate Tabasco sauce, but I actually kind of love it. These sound so delicious for my stomach and so terrible for my arteries. Putting a salad in a bacon cup isn't going to prevent the heart attack, so I say just go all out and putt scrambled eggs in them instead. I haven't tried it yet. The .01% of my brain that is concerned for my health is telling me not to. I have a feeling that if I was photographed eating one of these, I would look like a doctor's office "unhealthy choices" poster child circa 1999. But it would be so worth it. What do you think? 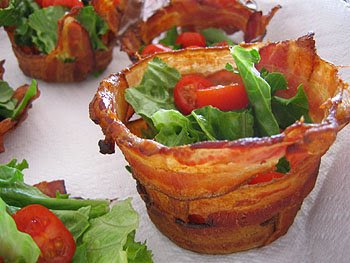 Those bacon cups look like possibly the most delicious thing on earth. Also, this is Joseph, I hope this stands as proof that I do indeed read your blog. my sister made something like that bacon thing. she pretty much lined a cup with bacon, then put some egg mixture into the little hole and then cooked it together. it was delicious. This is God leaving you an anonymous comment. Update your blog.